We will be setting up a load balancer using two main technologies to monitor cluster members and cluster services: Keepalived and HAProxy. Keepalived uses LVS to perform load balancing and failover tasks on active and passive LVS routers, while HAProxy performs load balancing and high-availability services to TCP and HTTP applications. lvs-hap03/lvs-hap04 – real servers, both running a pre-configured Apache webserver with SSL. Two HAProxy load balancers are deployed as a failover cluster to protect the load balancer against outages. We are going to use multi-port services (HTTP and HTTPS), therefore firewall marks to bundle together different, but related protocols, are required. We are going to user direct routing with HAProxy. Building a load balancer setup that uses direct routing provides increased performance benefits as direct routing allows the real servers to process and route packets directly to a requesting user rather than passing all outgoing packets through the LVS router. Direct routing reduces the possibility of network performance issues by relegating the job of the LVS router to processing incoming packets only. Load balancing in HAProxy also requires the ability to bind to an IP address that is nonlocal, meaning that it is not assigned to a device on the local system. This allows a running load balancer instance to bind to a an IP that is not local for failover. HAProxy performs load-balancing management on layer 7 (application layer). It is a common use case to deploy an HAProxy for HTTP-based load balancing. We are going to configure HAProxy on the master router node, the lvs-hap01. Our HAProxy /etc/haproxy/haproxy.cfg configuration is below. The 10.8.8.40.pem file contains our self-signed SSL certificate together with the private key. # use if not designated in their block. # "X-Forwarded-For" may be added by HAProxy to all requests sent to the server. # This header contains a value representing the client's IP address. # Main frontend which proxys to the backends. # Round robin balancing between the various backends. roundrobin: round robin selects servers in turns. This is the default algorithm. leastconn: selects the server with the least number of connections, it is recommended for longer sessions. Servers in the same backend are also rotated in a round-robin fashion. source: this selects which server to use based on a hash of the source IP i.e. your user’s IP address. This is one method to ensure that a user will connect to the same server. Do not forget to start the HAProxy service on the backup node. The keepalived daemon runs on both the active and the passive LVS routers. Both routers running keepalived use the Virtual Redundancy Routing Protocol (VRRP). The active router sends VRRP advertisements at periodic intervals, and if the backup routers fail to receive these advertisements, a new active router is elected. Keepalived performs failover on layer 4 (transport layer), upon which TCP conducts connection-based data transmissions. When a real server fails to reply to simple timeout TCP connection, keepalived detects that the server has failed and removes it from the server pool. Backup the config file before editing. This entry was posted in High Availability, Linux and tagged CentOS, HAProxy, Keepalived, LPIC-3. Bookmark the permalink. If you notice any errors, please contact us. I am new to set load-balancer in a direct-routing haproxy+keepalived mode. After read this post, I have some questtions on setting configuration. 1. My backend servers are database server, so I have to set “mode tcp” in haproxy.cfg, any other parameter I should notice? 2. 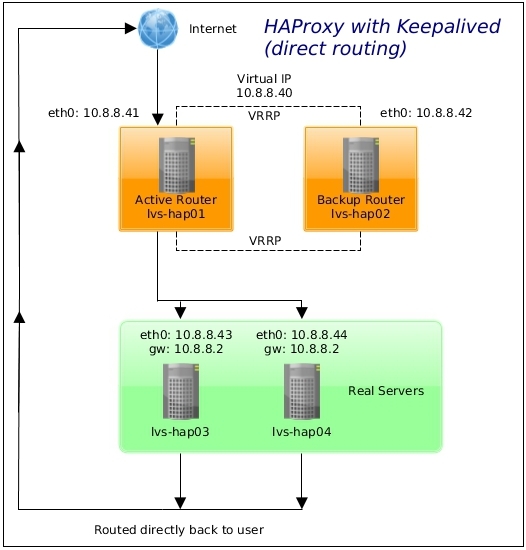 According this post, direct-routing is accomplished by keepalived or haproxy ? 3. You set load-balance on haproxy.cfg (backend session) and keepalived.cfg (virtual_server session), will it conflict ? 4. You set-mark on incoming packets, for what ? Some articles use set-mark + ip route + ip rule for transparent proxy. In your case (all server in the same LAN), is it necessary ? Yes, database servers need to use the tcp mode. Direct routing is done by keepalived (VRRP). I marked incoming packets to be able to use both HTTP and HTTPS. Direct routing is done by keepalived, so haproxy is for http/https (mode http) load balance ? In my database load balance case, only use keepalived is ok or also need haproxy setting ? Using haproxy + keepalived(direct route) in my case, will it show in/out connection statistic in its web ? Yes, HAProxy is used for HTTP/S load balancing in this article. You need HAProxy to load balance databases, but you don’t have to use keepalived if you don’t want a failover. for this to work ? You do need those, and both are mentioned in the blog post. Keepalived_vrrp exited due to segmentation fault (SIGSEGV). Your feedback is appreciated Christian! I’ve updated the article.